Symptoms of a propylene glycol reaction in cats include depression, loss of coordination, muscle twitching, and excessive urination and thirst. If your cat has consumed the recalled product and has these symptoms, please contact your veterinarian. The recalled product is packaged in a 2 oz., plastic stand up pouches with the UPC 859610007820 and “Best If Used By” dates April 24, 2016 and July 24, 2016. 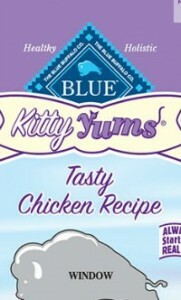 No other Blue Buffalo products are involved in this recall.